Fast versteckt zwischen den beliebten Zielen Rom und der Toskana liegt das nördliche Latium, eine Region mit schöner Landschaft und glanzvollen Bergstädten. Diese geführte Fahrradtour führt Sie in diesen fantastischen Teil Italiens, wo Sie durch das Tibertal und die unglaublichen Bergstädte Civita di Bagnoregio und Orvieto radeln. Erkunden Sie letztere zu Fuß und beenden Sie die Tour mit einem Abendessen in einem Weinkeller. Das Mittagessen und eine Zugfahrkarte zurück nach Rom sind ebenfalls im Preis inbegriffen. Radeln Sie auf diesem ganztägigen Radausflug ab Rom durch das nördliche Latium und nach Umbrien. Nach der Strecke vom Treffpunkt zum Bahnhof nehmen Sie Ihr Fahrrad mit in den Zug und fahren aus der ewigen Stadt ab. Während der einstündigen Fahrt nach Norden haben Sie die Möglichkeit, die römische Landschaft zu bewundern. Wählen Sie zwischen einem E-Bike und einem Mountainbike und beginnen Sie die Fahrt mit Ihrem Reiseleiter. Fahren Sie durch das üppige Tibertal und die Oase von Alviano, die ein Naturschutzgebiet ist. Nehmen Sie sich etwas Zeit, um ein schnelles Mittagessen zu genießen, das vom Reiseleiter bereitgestellt wird, und fahren Sie dann weiter ins beeindruckende Civita di Bagnoregio. Nachdem Civita aufgrund häufiger Erdbeben ausgestorben war, wurde es dank einer Reihe von Künstlern wiederbelebt, die die Stadt entdeckt und restauriert haben. Heute ist es voller Restaurants und Kunstgalerien. Hoch oben auf einem steilen Hügel gelegen ist die Stadt ein prächtiger Anblick. Als Nächstes radeln Sie in Richtung Orvieto, wo einige Anstiege zu bewältigen sind. Aber die Mühe lohnt sich: Sobald Sie Orvieto erspähen, werden Sie verstehen, warum. Die mittelalterliche Stadt liegt majestätisch auf den Klippen. Besuchen Sie die Stadt, erkunden Sie die beeindruckende Kathedrale und spazieren Sie durch die vielen engen kopfsteingepflasterten Gassen. Wenn alle Teilnehmer Hunger haben, gibt es gute Neuigkeiten – als Nächstes gibt es eine herzhafte Mahlzeit in einer der vielen Weinbars der Stadt. Genießen Sie Käse, Salami, Salat, Nudeln und jede Menge Wein aus der Region. Danach fahren Sie mit dem Fahrrad zum Bahnhof und steigen dort in den Zug für die einstündige Fahrt zurück in die italienische Hauptstadt. This was the highlight of our trip to Rome! It was such a fun, exciting way to see some small towns and the countryside of Italy! Our tour guide, Imke, was great and very knowledgeable. It was a small group of us 4 total on the trip. We biked about 18 miles from Alviano to Civita di Bagnoregio - it definitely helps to have the electric bikes for this stretch because it's mostly uphill, but the bikes make it very manageable! After about an hour and half exploring Civita de Bagnoregio, we biked another 12 miles downhill to Orvieto and had another hour and half to explore there before dinner. Our dinner was so delicious and one of the best we had in Italy! I can't recommend this trip enough! Now this was an amazing tour! It was just my husband and I and our guide Imke!!! We did a ton of riding so if you are not a bike rider 30 miles at a crack don't do this tour because you will not be happy. Lots of big hills. You can use the electric motor if you don't want to challenge yourself but it is still going to be a ton of work. 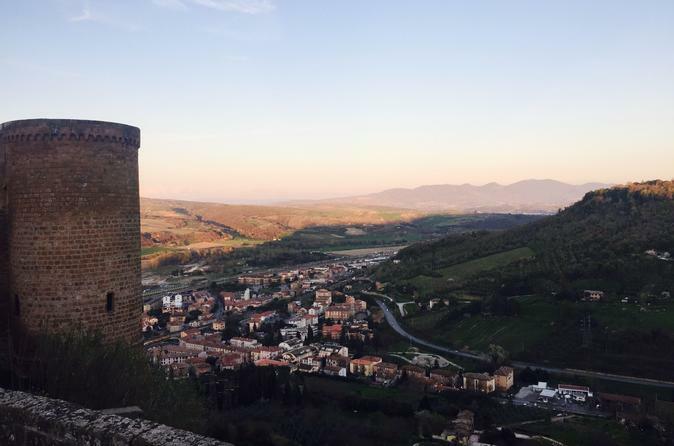 Orvieto was a storybook dinner spot after taking the tram up and we loved it! Civita di Bagnoregio was the first medieval town I've ever visited and it was pretty spectacular! The day was perfect so many little adventures and the scenery was stunning. Perfect day, perfect tour for us and a perfect guide! Thanks Imke!! What a wonderful experience! Loved the electric bikes! I highly recommend!! Had a great time on this tour. Our guide, Emmanuel, was awesome. So much local knowledge. With the E-bikes, only the final hill was a bit challenging. If you can bike slight slopes around your town this shouldn't be too hard to do. Highly recommended. This tour is highly recommended for fit and accomplished bicyclists. It is a great ride. The information given by Viator in the is somewhat misleading and might be a surprise to some who come expecting a nice ride of a few kilometers in the country. This tour expects you to ride through rush hour traffic to the train station board a train hefting your bike on board, getting them off again. Then off you go for about a 30 plus kilometer slog to Civta di Bagnoregio gaining about 1000 feet in elevation in the process mostly toward the end of this portion of the ride. The mostly down hill portion of the ride to Ovieto is over a fairly busy highway. Now that I have done with negative, it was great!! Ride a train then bike through the Italian countryside in the midst of wheat fields, vineyards, and over the Tiber. The guide Immanuel was excellent and safety was his priority. He looked over us like a mother goose the entire ride. He also made it abundantly clear when we showed up that this ride was long and that we would need electric bikes. Ah the electric bikes they were life savers. The bikes gave you a push that allowed old folksboth over 60 like us the ability to make it. Mind you we both are fairly fit and go the gym to work out on a regular basis. At both Civita di Bagnoregion and Orvieto you time to explore on your own. Plenty of snacks and sandwiches were provided and a nice nearly full dinner with wine pairings are provided at the end of the trip at Orvieto. I completed this trip in late March of 2016 and absolutely loved it. Civita di Bagnoregio is stunning and there were few if any tourists I had the city to myself. Orvieto has more tourists but again its a stunning city with a beautiful church - our dinner was excellent. The guide and tour company were excellent and I have no complaints. A few important notes. First, you must be an avid cyclist or spin class attendee to complete this trip. If not utilize on of the motorized bikes. 90 of this ride is on roads where you will not see any cars. There are one or two stretches with heavy traffic - I'm not recommending these sections of roads for kids unless they are comfortable on a bike and can stick to the shoulder. I'd also recommend wearing comfortable cycling clothing and bring some dry clothes. I was worried about protecting valuables in the train station so I gave up some comfort in clothing to have the security. In the future, I will simply buy one of those pouches that hangs from your neck to hold valuables. Again this is a once in a lifetime 50K ride, through wine country. We had lunch on the top of hill surrounded by wineries and olive trees. If you get a chance do this trip!! 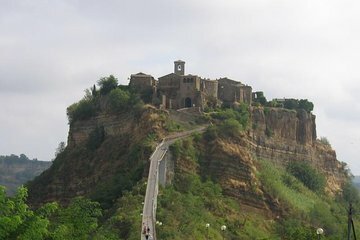 What ever you do you must see Civita di Bagnoregio it is the most beautiful and amazing village. Getting there is the difficulty with quite strenuous bike riding even with e-bikes. We raced through the streets of Rome in peak hour traffic on our bikes to catch a train which we felt uneasy with. It's quite difficult loading the bikes onto the train but the initial ride through the Italian countryside was fantastic. We cycled 60k's on this trip and had to rush because of an impending storm. Civita di Bagnoregio is so stunning it deserves a much longer stay. The wine tasting and local food delicacies at Orvieto was a wonderful experience too.